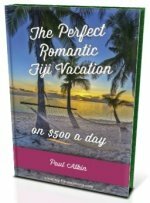 List of Airports in Fiji - Which airport do I fly into? Which airport do I fly into? Check out the list of airports in Fiji with the two international airports and a host of smaller strips. It can take you close to the farthest flung islands. They are grouped into island groups with Taveuni Island included in the Vanua Levu group. Airport uses range from domestic hubs to private strips to strips that are barely used. Some of the strips to the outer islands have no accommodation and in some cases is illegal for tourists to arrive uninvited. Viti Levu contains Fiji's two international airports in Nadi and Nausori. They are also the two main domestic hubs. Vatulele and Laucala airports are used to serve their upmarket resorts. The domestic airports here are Labasa and Savusavu Airports on Vanua Levu and Matei Airport on Taveuni. The domestic airports on the Mamanucas are Malolo Lailai and Mana which also transport visitors to the resorts. Vunisea airport is used for domestic travel with daily flights from Suva and Nadi. Wakaya Airport is private being used to transfer tourists to it's upmarket resort. The other three are used for domestic travel from Suva with daily flights to Levuka and weekly flights to Koro. On last check, there are weekly flights to Lakeba, Moala, and Vanuabalavu Airports. Rotuma decided not to open for tourism although it is possible to visit. However with minimal accommodation and weekly flights which sometimes cancel. The domestic airports are run by Airports Fiji Ltd. Visit their website for more information.